We compiled some of our favorite hikes – Click here to view! 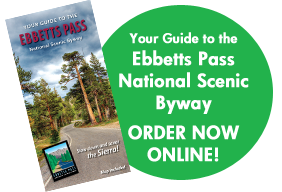 On the west side of Ebbetts Pass hiking is available on roads and trails in Calaveras Big Trees State Park, as well as 279 miles of hiking trails maintained by the Calaveras Ranger District of the Stanislaus National Forest. Grover Hot Springs State Park and the Carson Ranger District also offer a multitude of hiking trails on the east side. Hiking opportunities range from short, easy day hikes to strenuous, multi-day backpacking trips. Most of these trails are at high elevation (above 6,000 feet) and are accessible only during the summer and early fall months, whereas hiking the Arnold Rim Trail by White Pines is open virtually all year. 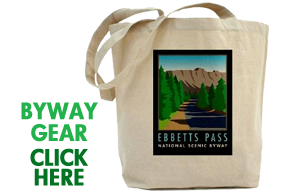 The nationally recognized Pacific Crest Trail crosses the byway at Ebbetts Pass, and there is a handicapped accessible paved trail along the shoreline at Lake Alpine with a network of trails originating from this location. The Mokelumne Coast to Crest Trail crosses the Pacific Crest Trail near Ebbetts Pass. The EPSBA is currently working on expanding our trails information but in the meantime there are quite a number of locally produced trail guides available at CalaverasOutside.org and others are available at the trails.com (a very commercial website). Maps and some hiking information are available at the Forest Service offices in Hathaway Pines and the Lake Alpine Ranger Station. 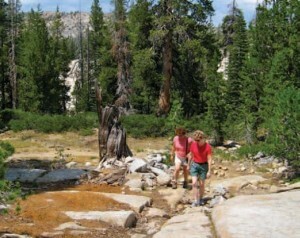 Another good source of information is the Tahoe to Whitney site where you can find information on several trails that cross Ebbetts Pass, particularly the Pacific Crest Trail and the Tahoe to Yosemite Route. This site is created and maintained by Alex Wierbinski who is an experienced four season hiker who is personally familiar with these routes. The Bear Valley Trail Stewardship Organization is a non-profit 501 c3 corporation that maintains, restores and builds multi-use trails in the greater Bear Valley area of the Stanislaus National Forest. We are a relatively new volunteer community organization that was founded in 2017. Our mission is to grow and enhance the greater Bear Valley and Ebbetts Pass corridor communities by working with the US Forest Service to promote recreational use and resource protection of the area’s trails and abundant public lands. Calaveras Outside is under construction. Rather than wait until all guides are complete, they are posting them in draft form for public use. As time permits, the guides will be updated. All trail and paddle advocates are encouraged to join this effort. Feel free to edit the guides and forward your revisions to them for integration into the database.